Back in 2016, Hackaday published a review of The National Museum of Computing, at Bletchley Park. It mentions among the fascinating array of computer artifacts on display a single box that could be found in the corner of a room alongside their Cray-1 supercomputer. This was a Transputer development system, and though its architecture is almost forgotten today there was a time when this British-developed microprocessor family had a real prospect of representing the future of computing. So what on earth was the Transputer, why was it special, and why don’t we have one on every desk in 2019? Inmos, based in Bristol, were a — no, make that the — British semiconductor company, in the days when governments saw such things as a home-grown semiconductor manufacturing capability to be of strategic importance. They made microcomputer peripheral chips, RAM chips, and video chips (the workaday silicon of 1980s computing) but their exciting project was the Transputer. 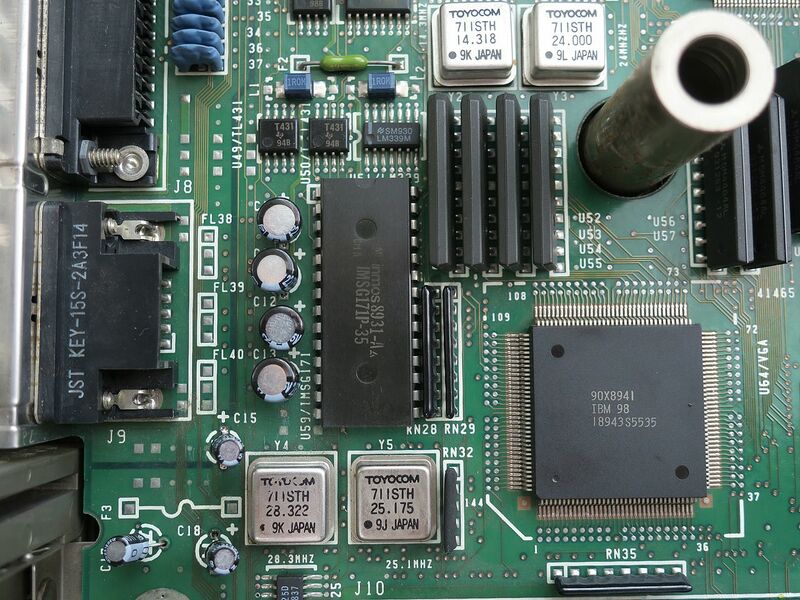 This microprocessor family addressed the speed bottlenecks inherent to conventional processors of the day by being built from the ground up to be massively multiprocessor. A network of Transputer processors would share a web of serial interconnects arranged in a crosspoint formation, allowing multiple of them to connect with each other independently and without collisions. It was the first to feature such an architecture, and at the time was seen as the Next Big Thing. All computers were going to use Transputers by the end of the 1990s, so electronic engineering students were taught all about them and encountered them in their group projects. I remember my year of third-year EE class would split into groups, each of tasked with a part of a greater project that would communicate through the crosspoint switch at the heart of one of the Transputer systems, though my recollection is that none of the groups went so far as to get anything to work. Still how this machine was designed is fun to look back on in modern times. Let’s dig in! When did computers arrive in schools? That should be an easy question to answer, probably in the years around 1980. Maybe your school had the Commodore Pet, the Apple II, or if you are British, the Acorn BBC Micro in that period, all 8-bit microcomputers running a BASIC interpreter. That’s certainly the case for the majority of schools, but not all of them. In early 1969 the BBC’s Tomorrow’s World visited a school with a computer, and in both technology and culture it was a world away from those schools a decade later that would have received those BBC Micros. The school in question was The Forrest Grammar School, Winnersh, about 35 miles west of London, and the computer in question was a by-then-obsolete National Elliott 405 mainframe that had been donated four years earlier by the British arm of the food giant Nestlé. The school referred to it as “Nellie” — a concatenation of the two brand names. It seems to have been the preserve of the older pupils, but the film below still shows the concepts of its operation being taught at all levels. We get a brief look at some of their software too — no operating systems here, everything’s machine code on paper tape — as a teacher plays a reaction timer game and the computer wins at noughts and crosses (tic-tac-toe). One of them has even written a high-level language interpreter on which younger children solve maths problems. Of course, a 1950s mainframe with hundreds or thousands of tubes was never a particularly reliable machine, and we see them enacting their failure routine, before finally replacing a faulty delay line. This is a fascinating watch on so many levels, not least because of its squeaky-clean portrayal of adolescent boys. This is what teenagers were supposed to be like, but by the late 1960s they must in reality have been anything but that away from the cameras. It’s a contrast with fifteen or twenty years later, the computer is seen as an extremely important learning opportunity in sharp opposition to how 8-bit computers in the 1980s came to be seen as a corrupting influence that would rot young minds. Of course, these youngsters are not entirely representative of British youth in 1969, because as a grammar school the Forrest was part of the top tier of the selective education system prevalent at the time. There would certainly have been no computers of any sort in the local Secondary Modern school, and probably the BBC’s portrayal of the pupils would have been completely different had there been. In 1974 the Government abolished the grammar school system to create new one-size-fits-all comprehensive schools, one of which the Forrest school duly became. Following the vagaries of educational policy it is now an Academy, and there is probably not a room within it that does not contain a computer. So what of Nellie? Because of the film there are plenty of online references to it in 1969, but we could only find one relating to its fate. It was finally broken up in 1971, with the only surviving component being a delay line. More than one Elliott machine survives in museum collections though, and your best chance in the UK of seeing one is probably at the National Museum Of Computing, in Bletchley. Consider the plight of a mid-career or even freshly minted electrical engineer in 1960. He or she was perched precariously between two worlds – the proven, practical, and well-supported world of vacuum tube electronics, and the exciting, new but as yet unproven world of the transistor. The solid-state devices had only started making inroads into electronic products relatively recently, and mass production techniques were starting to drive the cost per unit down enough to start including them in your designs. But, your company has a long history with hot glass and no experience with flecks of silicon. What to do? To answer that question, you might have turned to this helpful guide, “Tubes and Transistors: A Comparative Guide” (PDF link). The fancy booklet, with a great graphic design that our own [Joe Kim] would absolutely love, was the product of the Electron Tube Information Council, an apparently defunct group representing the interests of the vacuum tube manufacturers. Just reading the introduction of this propaganda piece reveals just how worried companies like RCA, General Electric, and Westinghouse must have been as the 1950s turned into the 1960s. The booklet was clearly aimed directly at engineers and sought to persuade them of the vacuum tube’s continued relevance and long-term viability. They helpfully explain that tubes are a reliable, proven technology that had powered decades of designs, and that innovations such as heaterless cathodes and miniaturization were just around the corner. Transistors, we’re told, suffer from “spread of characteristics” that correctly describes the state of materials engineering of silicon and germanium at the time, a thornier problem than dealing with glass and wires but that they had to know would be solved within a few years. With cherry-picked facts and figures, the booklet makes what was probably in 1960 a persuasive case for sticking with tubes. But the Electron Tube Information Council was fighting a losing battle, and within a decade of swamping engineers with this book, the industry had largely shifted to the transistor. Careers were disrupted, jobs disappeared, and fortunes were lost, but the industry pressed forward as it always does. Still, it’s understandable why they tried so hard to stem the tide with a book like this. The whole PDF is worth a look, and we’d love to have a hard copy just for nostalgia’s sake. Thanks to [David Gustafik] for the tip. It’s January, and that means it’s time once again for the Consumer Electronics Show. CES is the place where electronic manufacturers from all across the globe to show off their future products and make promises they probably can’t keep. Of course there is no better indicator of a company’s future than looking at the past, and thanks to [Home & Garden Television] we have a comprehensive look at what CES was twenty three years ago. The cable channel aired a special, “Plugged In with Wil Shriner”, covering CES 1996 and it is certainly illuminating to see in hindsight. Plus it even comes complete with “cable money” tier mid 90s motion graphics. Dual recording VCR from Sharp on one VHS tape provided you can fix the tracking with the remote. The term “I triple E 1394” may just have been said for the first (and last) time ever on cable television. A digital alarm clock from Oregon Scientific (called the Time Machine) that will tell you the weather. Magellan thought, “Who needs a cell phone when you can have a satellite phone for $8000”. Soundtube, the fashionable beer cozy for your gigantic speakers as seen on MTV Beach House. Noise Cancellation Technologies INC wanted to turn your cars headliner into a big ol’ speaker. Cyber Pong promised online multiplayer a full decade before Rockstar’s Table Tennis on Xbox 360. The Simpsons Cartoon Studio helps create fan fiction on multimedia CD-ROM. Compaq’s PC keyboard with an integrated fax machine. Norris Communication’s handheld voice recorder full of flash memory to offload to your PDA. Crestron’s idea of home automation involved a touchscreen to operate a light switch (some things never change). DVD players a year before the first ones would hit the United States. DVDs of an R-rated movie projected to also contain the G and PG-13 rated versions of the same movie. Sharp introduces the world’s largest LCD display (which is 28 inches). If you are under a certain age, you probably associate Radio Shack with cellphones. While Radio Shack never gave us access to the variety and economy of parts we have today, they did have one thing that I wish we could get again: P-Box kits. The obvious questions are: What’s a P-Box and why do I want one? But the kit wasn’t to make a P-Box. P-Box was the kind of box the kit came in. It was like a piece of perfboard, but made of plastic, built into a plastic box. So you bought the kit — which might be a radio or a metal detector — opened the box and then built the kit using the box as the chassis. The perfboard was pretty coarse, too, because the components were all big discrete components. There was at least one that had an IC, but that came premounted on a PC board that you treated like a big component. One of my favorites was a three-transistor regenerative shortwave receiver. In those days, you could pick up a lot of stations on shortwave and it was one of the best ways at the time to learn more about the world. On the left, you can see a picture of the radio from the 1975 catalog. You might think $7.95 is crazy cheap, but that was at least a tank full of gas or four movie tickets in those days, and most of us didn’t have a lot of money as kids, so you probably saved your allowance for a few weeks, did chores, or delivered papers to make $8. It seems crazy having to explain what a piece of technology was like to someone who is barely fifteen years your junior, but yet we have reached that point when it comes to CRTs. There may still be remnants of CRT televisions and monitors left out in the wild, however, the chances that a kid preparing to enter high school has encountered one is slim. While there may be no substitute for the real thing, there is this raw video from [Glenn] who shared his tour of the Sony Trinitron assembly line in the early 2000s. Sony Electronics’ cathode ray tube manufacturing facility was located alongside headquarters in Rancho Bernado, CA. The facility was shuttered in 2006 when Sony transitioned wholly onto digital displays like the flat-panel LCD line of Bravia televisions. [Glenn]’s video shows that the manufacturing process was almost entirely automated from end to end. A point that was made even more clear with the distinct lack of human beings in the video. The Trinitron line of televisions first appeared in 1968. At a time where most manufacturer’s were offering black and white picture tubes, Sony’s Trinitron line was in color. That name carried through until the end when it was retired alongside tube televisions themselves. Sony’s focus on technological innovation (and proprietary media formats) made them a giant in the world of consumer electronics for over forty years in the United States, but in the transition to a digital world saw them seeding market share to their competitors. A quick word of warning as the video below was shot directly on Sony’s factory floor so the machinery is quite loud. Viewers may want to reduce the volume prior to pressing play. ChangosMuertos wrote a reply on Linux-ESPNOW. Ted Yapo wrote a comment on project log How can I trip the current at arbitrary, adjustable values ?. martinlebel liked Defcon 27 TV3Y3 Badge. skrodahl has updated the log for Muffsy Stereo Relay Input Selector. Enki has added a new log for Paperworker. BK liked Power Stacker: Stackable Battery System. Dustin Kimmel has updated the project titled Dev kits for a team project. morgan wrote a reply on Linux-ESPNOW.